STRIKE BLAZINGER: COMING IN 2019-2020 TO PC, CONSOLES, AND ARCADES! "Strike Blazinger" is an exciting high-speed action game currently under development by Hitsparks Games. Combining fast fluid action with quest elements in a deep sci-fi universe, Strike Blazinger strives to deliver fun classic action evolved with modern technologies and graphics. While "Strike Blazinger" pays homage to great sci-fi games of the 8 &16 bit era such as "Phantasy Star", "Space Harrier", "Starfox", "Night Striker" and "After Burner" - we aspire to offer a unique gameplay experience that builds a new genre. Our planned platforms include PC, console, and dedicated arcade machines. Strike Blazinger's development is empowered by industry veterans with an unparalleled love for games who have contributed to games and franchises such as "Gauntlet", "Street Fighter III", "Street Fighter Alpha", "Marvel Vs. Capcom", "Tetris", "Primal Rage", "The Sims", "Sega / 2K World Series Baseball", "Guacamelee", and "Dawngate". Strike Blazinger is our *dream project*, and we hope to leverage our experience, passion, and extreme insistence on satisfying game play to create something truly special! 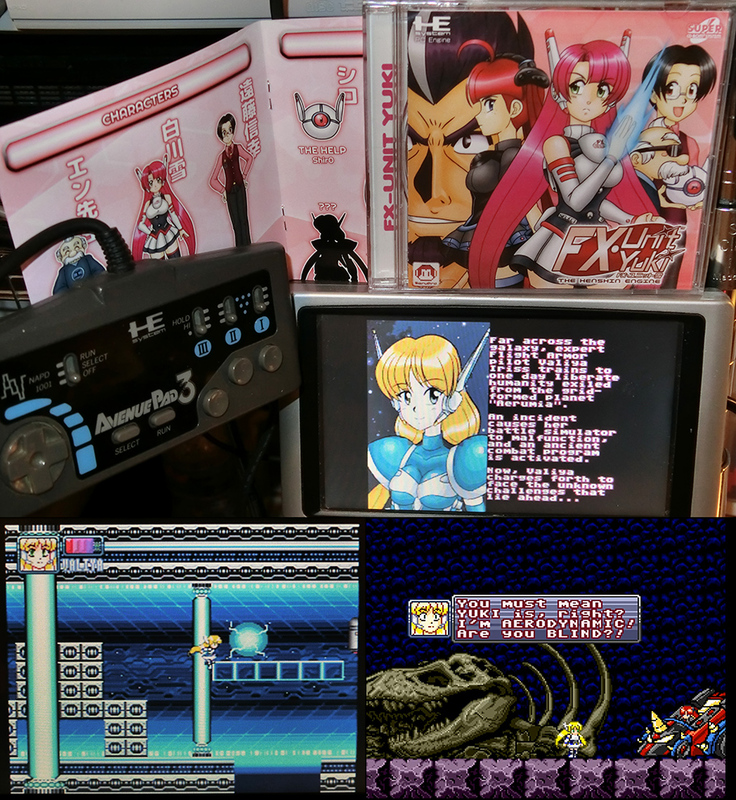 OUR MAIN CHARACTER, 'VALIYA IRISS' INVADES PC ENGINE/TURBOGRAFX, GENESIS, DREAMCAST AND PC WITH "FX-UNIT YUKI"!! JOIN US AT THE PORTLAND RETRO GAMING EXPO 2017, OCTOBER 20-22!! 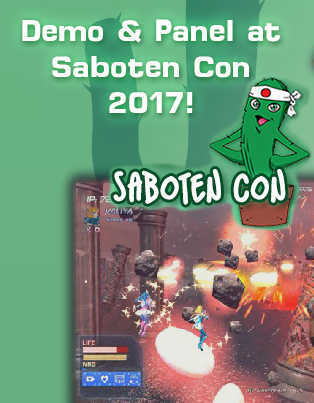 WE RETURN TO SABOTEN CON 2017 IN PHOENIX, AZ: SEPTEMBER 1-4!! 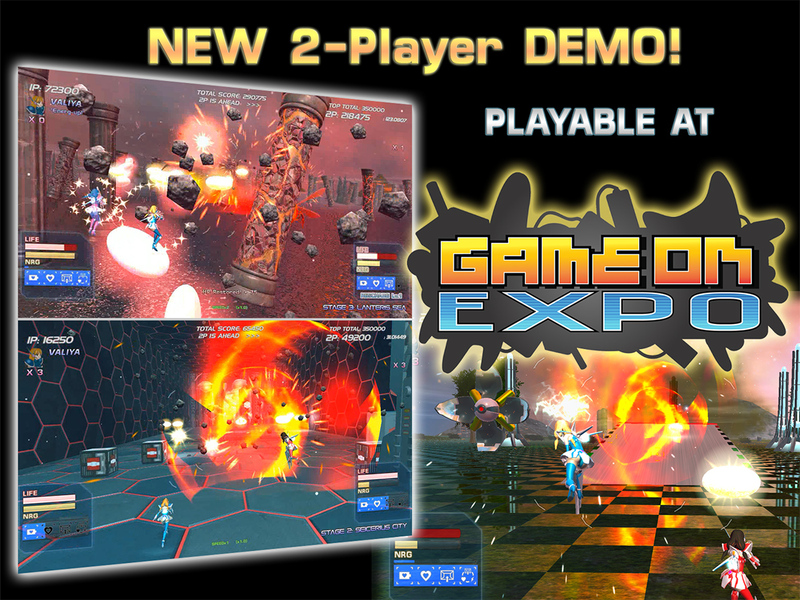 PLAY THE NEW 2-PLAYER DEMO AT GAME ON EXPO IN PHOENIX, AZ: AUGUST 11-13!! We'll be returning to Phoenix, Arizona from August 11-13 for the awesome GAME ON EXPO event! We've got a new demo that now features 2-player simultaneous high speed action! Team up and blast your way to victory: heal your partner with SP techniques, launch portals you can both super-attack through, and see who gets the higher score! There's also the start of a weapons loadout system: currently you can select between "Starshots" and "X-Missiles" for your lock on shots: the Starshots fire more frequently while the missiles do more damage but take longer to fire again. Our station will feature an amazing 1440p Yamakasi Catleap S-IPS monitor and MOTION SIMULATION EFFECTS provided by the upcoming WHIRLWIND VORTX peripheral prototype that lets you feel the speed of flight and the impact of hits! 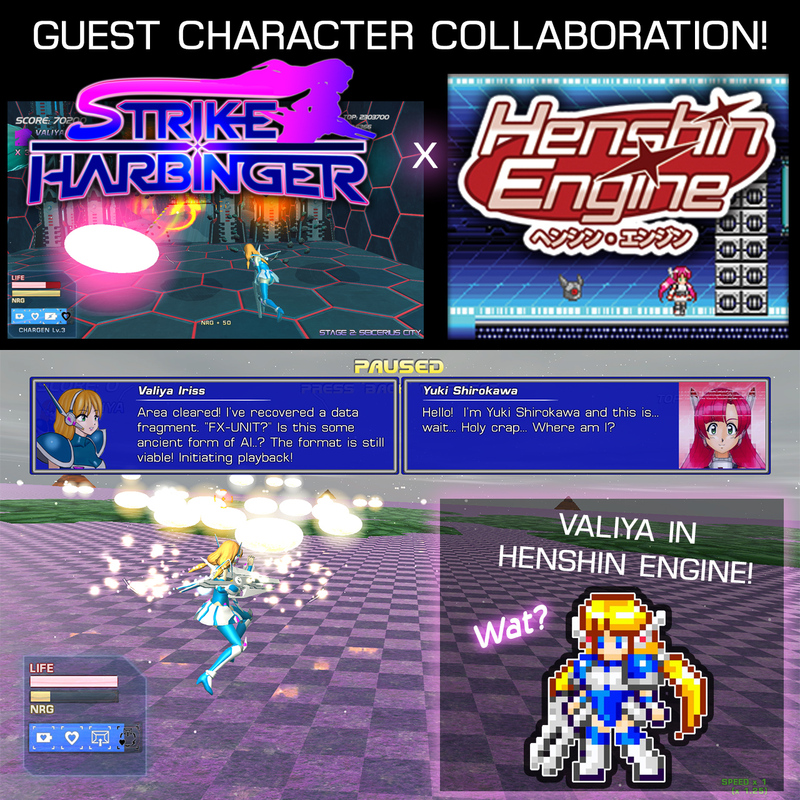 GUEST CHARACTER COLLABORATION WITH HENSHIN ENGINE! 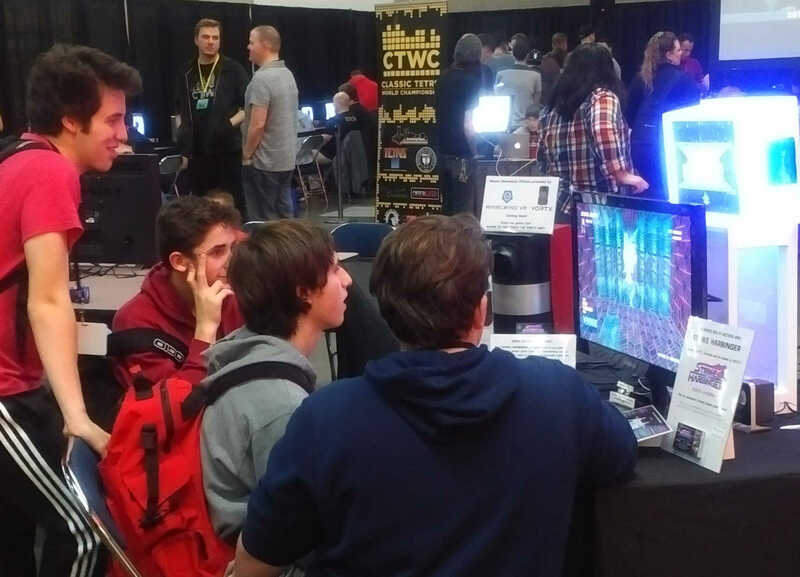 Check out Henshin Engine and Strike Harbinger at the Portland Retro Gaming Expo this October, where both games will be featured and playable! Click the image above to visit the Henshin Engine Kickstarter! 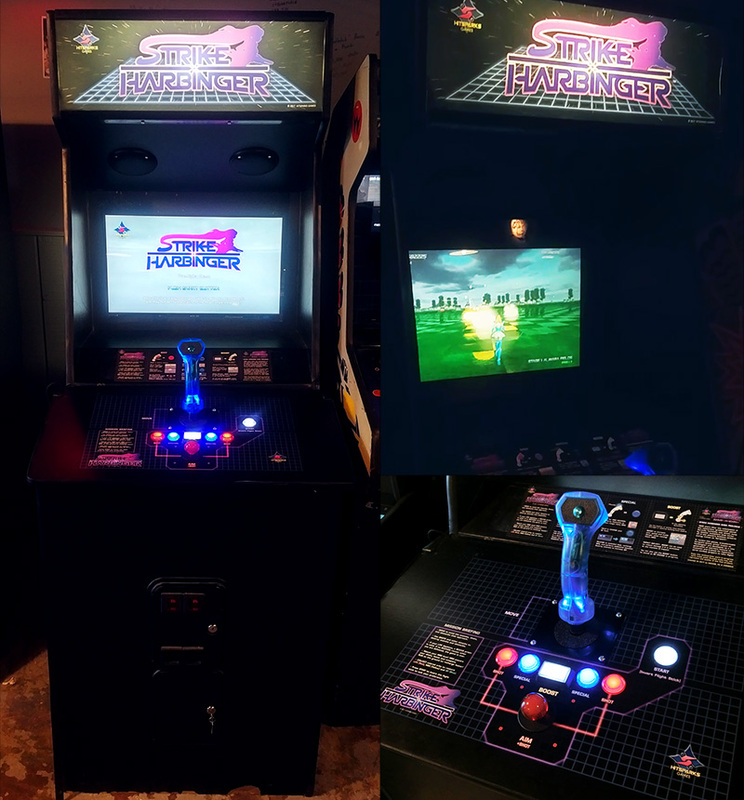 CATCHING UP WITH OUR SURPRISE REVEAL AT GALLOPING GHOST ARCADE! 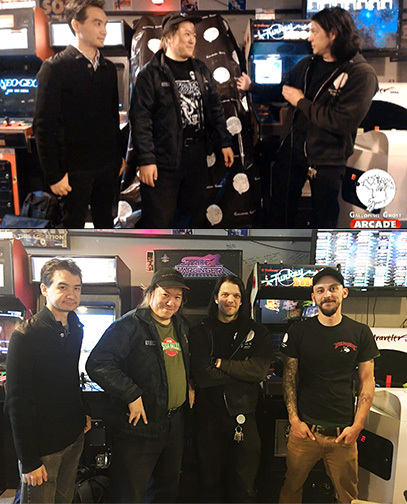 On April 30 2016, the game was unveiled to the public for first time at the world-famous Galloping Ghost Arcade as a surprise conclusion to their SEGA Week event: as an arcade machine! With a three-level playable demo and specially engineered dual-stick analog arcade controls, the unveiling was streamed on Twitch, and the demo available for play for three days. While the intent was a surprise reveal for a limited key audience, the story has gotten more traction than we anticipated - necessitating a rapid building of this website. Strike Harbinger is currently in a very early phase of development; roughly only 5% -10% complete. An official announcement with an actual trailer and more details on our planned feature set is forthcoming. We will be able to evaluate our options for publishing or crowdfunding once we are further along. Thank you for your interest, and we hope to update more information here as development progresses!